As Cagsil noticed, we are in the process of testing out some changes to our text capsule editor. It's been turned on for a small number of specially selected trial users for a couple of days already, and now it's available to all. In order to switch, just change the settings on your profile settings page under my account. Resizable edit area - After clicking "edit" on a text capsule, you can hold your mouse down when it is over the lower right corner of the edit box and drag the corner in order to size the edit window comfortably for your screen. Word count - the number of words in your text will appear at the top of the edit dialog, while you are editing a text capsule. Hub search - search for Hubs that are relevant to your selected word, or phrase. This search takes into account the category of your Hub. So, the results should be both more convenient and more relevant while you edit your capsule, than opening another browser window to search for Hubs to link to. Search your own hubs - the link tool allows you to search your own Hubs. This should be more convenient for creating links to your own hubs, especially if you have a lot of them. Amazon links - the link tool will now allow you to search for Amazon products appropriate to your hub and create links to them. Links entered in this way are subject to revenue sharing splits, and you are still bound by our rules on affiliate linking (no more than 2 per hub). Keyboard short-cut - While typing text into a text capsule, you can strike ctrl-e. This will automatically select the nearest word an launch the link dialog. From there you can hit enter to search for relevant Hubs and use keyboard navigation to select the Hub you want to link to. This allows you to add links to your text without taking your hands away from the keyboard. Good to know that Hub Pages stays in the loop and progresses. I am new here but would like to say updates such as this instill confidence in this site for me. Update: There are some known issues with relative links in the HTML source editor. We are working to fix those. If you edit HTML by hand regularly, you may want to wait a day or two before switching. Ah ok thanks, often I update or edit text using my iPhone. Because it is impossible to edit directly into the text capsule with iPhone at this time, I have to click HTML which opens in a new window. After editing I then click update HTML and it brings me back to the text capsule with saved edited information. So far it is the only work around that works for the iPhone. I had to come back to this thread after selecting to change to the new version but its ok I will wait. On vacation for the past week and left my laptop at home for a break but of course I managed to work around that too. / Welcomes new changes !! This problem has been resolved. The html editor should be working fine now. Oh My... I am one of the computer 101 minus 8 students and Paul throws in all this lingo that I have no clue about... LOL... I will eventually dig myself out.. Look for me next FEB.. to see if it is going to be another 6 weeks of winter or not! I don't get why the links module allows you to link to amazon when we already have the amazon module. As far as revenue sharing doesn't that apply to the Amazon module? What is the difference between the 2? Thank you for constantly working to make HubPages better. It is a pleasure writing on HubPages, and love the new improvements. Thanks again. Hubpage just keeps getting better and better! Thanks to all involved in bringing these helpful changes and added resources. I have the same options on my sites, they work well. so now ALL amazon links on the site will be forced into the share model? No, you can still manually create amazon links that do not share revenue if you want. We think the convenience of the tool may be worth the price. If you put your own amazon affiliate link into a text capsule, you will get 100% of the revenue. If you use an amazon capsule or the new linking tool you will get 60%. Lily, all you have to do is create appropriate text and then hyperlink your key phrase to your amazon affiliate URL to the product you want. I'm not sure but you may also be able to use the link generated when you use the "link to this page" function on amazon. nice! Thanks again for the improvements. I noticed today a hub where the hubber linked to her own non-relevant hubs because of one word she used which has more than one meaning. I'm surprised that writers don't realize this appears manipulative to the reader if someone clicks on the word expecting relevant information! I like the new Editor. It is great. The Photo capsule needs work also. When you click to find My Photos by category (name we chose), it does not work. Example: I have divider bar photos named "divider bars." I type in the name, the drop down appears and I click it and the name moves into the box. Then...nothing happens. I am stuck with photos as they originally were. Can this be fixed? Hi ! Just had a try of it now , love the word counter thanks ! make it easier . 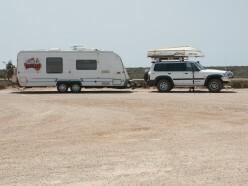 We are setting off in a couple of weeks up North of WA and across the top of Australia so I will be doing a lot of hubs as we go! Cool Beans! I am excited! Thanks for the update. I have selected to try the new editor, but I still cannot see a word count in the capsules. So glad to see this! Changing edit size, and offering word count (I have Mac which doesn't offer easily) are small but welcome changes! The rest I have to digest. Thank you! I'm excited to try out the new text capsule editor features. Though I do most of my writing in MS Word and then insert into the capsules these new features hopefully will make tweaking our hubs easier. I have been waiting for the resizable edit area for a long time. Thanks for the effort! This sounds good. Will have to change my settings and give it a try. Sounds like a good update. Thanks for the continual tweaking and help to make this site better and better. I think the word count doesn't work....I edited a text capsule and can't find the word count. did you change your profile settings as linked in the first paragraph of the OP? I changed profile setting as instructed. I cannot see a word count or anything else different to what was there before. the word count is on the left top corner of the text capsule. It's so cool! This is getting REALLY FRUSTRATING!!! I know it is supposed to be on the top left, but I CANNOT SEE IT! No, I don't see that at all. There is nothing between "text" and the ? in a circle. Yes, I have made the change in my profile to say I want to try the new editor. OK, you still do not see it then. Hmmm, what browser? I use Firefox. You may need to e-mail staff or give it a little bit more time. With this being new, there may be glitches with it. I'm using Chrome. I used to use Firefox, but it was using huge amounts of memory and CPU time and hanging my computer all the time. My laptop is only 18 months old, Lenovo SL500, so it's not as if I was trying to run it on some really ancient machine. Same here, but I can see the word counts. So looks like the browser probably isn't the problem. The count only shows up when you are in edit mode for a specific text capsule, and then only, if you have edited your profile to opt in to trying out the new text capsule editor. Yes, I have opened several hubs to edit them. I have changed my profile to opt in as well. Please do not treat me as if I am stupid. I checked your account, and the beta setting is in effect. So, that is not the issue. 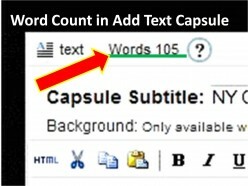 By editing a text capsule, I mean opening a hub for editing, and clicking of the edit button of a specific text capsule. The word count should then show in drag bar for the text capsule that is being edited. If you are doing that, and not seeing a word count, it is a bit of mystery to me, and I would like to why. Apologies for my penchant for precision. I don't mean to imply anything about you, just my experience is that it is usually the things I assume that lead me into the weeds. Maybe you could try editing a hub with Firefox, for the sake of experimenting, and see if it shows up for you there. If it does, then we can safely conclude that the issue is with Chrome (caching issue I suspect). OK, I set off to clear my cache in Chrome, but went into a hub again for one last look before I did. Problem has resolved itself. I am no wiser, but I have the word counts! You had to work for that one!!! Glad you got it resolved. The thanks should go to Mark and James, they did the fine work on this. Thank you Mr. Paul Deeds! Nice! Three cheers for the word counter! What would be a super, super enhancement on top of that would be a counter for the whole Hub, not just for each text box. Any chance of getting a total count to show in edit mode, like a total count appears in Stats after a Hub is published? Using chrome too and works well. Did you go back to your profile to see if the change was saved. Yes, I have "Ok, I will try the new text module editor" selected. Sounds like great changes. I'm really excited to try them out! Word count very handy - am still playing with the search features - neat stuff! Nice! How great is this update? Havent tried it yet but sounds like a really good change. The word count as others have said will be very handy. That word counter will be a great addition. I always had to use word counter. Thanks for working to make HubPages better. Haven't tried it but sounds great. Can't wait to try it out! I have a problem with the new text editor in that it doesn't let me change the link location to open in a new window - there is no longer an option for this - is this part of the design or is it a fault as I will be putting in far less links if this is how it is going to work in future! I think its a nice enhancement and a good step forward to bringing HubPages back up into favorable Google territory again.